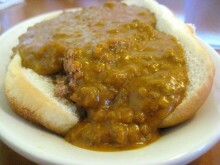 With nearly every visit back to Michigan (time permitting), there is a requisite stop at a Coney Island. You can’t drive more than a few miles in the metro Detroit area without hitting a Coney, and I’m pretty sure they are all awesome. My go-to Coney growing up was Leo’s, but sometimes convenience outweighs loyalty. So last time I was back in the homeland, we went to Lulu’s Coney Island in Walled Lake.